Make celebrating St. Patrick’s day fun and easy with this adorable leprechaun lunch. It’s cute as can be and super fun for kids, but it’s also a healthy lunch option for the holiday. 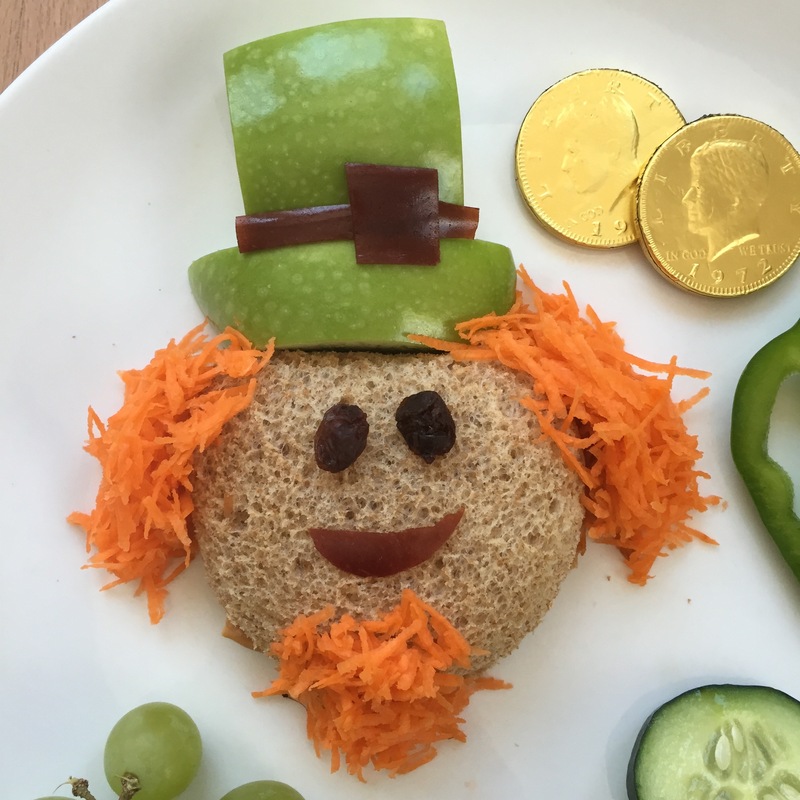 All you need with the adorable leprechaun sandwich is your favorite green fruits and veggies. You can even add a little bit of food coloring to some ranch dressing if that will help your kids eat up those veggies. There are so many options of great green foods, just pick your kid’s favorites. My kids love green grapes, bell peppers and cucumbers. Making the leprechaun sandwich is actually pretty easy! Using a circle cookie cutter or a large drinking glass cut your sandwich into a circle. Cut a Granny Smith apple for the hat, you’ll need a square and a rectangle. Put the apple hat on the sandwich and add the shredded carrot around the sandwich for hair and a beard. Add two raisins for eyes and cut the fruit leather to make a smile and a buckle for the hat. Serve with your favorite green fruits and veggies. Remember to make this fun for everyone, don’t worry about making everything perfect! A lopsided hat looks and tastes just the same to your little ones! 🙂 We hope you have a fun holiday and have fun celebrating with your kids!